Heaven's Best Carpet Cleaning has been servicing Manhattan and the surrounding area for over ten years. All work is guaranteed. The cleaning process uses a low moisture cleaning solution which is dry in about one hour, allowing you to return to your day, sooner. It's environmentally friendly and provides quality service by friendly and thorough technicians. A carpet protector is also available to help protect your carpet against stains and spills. Technicians will measure and tell you up front the exact charge. There are no hidden charges. 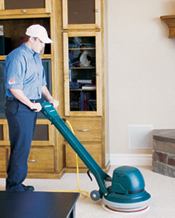 We vacuum and move most furniture, as well as clean. When the cleaning is complete we rake the area in order to make the carpet look and feel like new again. Your upholstery can be cleaned as well, and the process includes a fabric protector, which penetrates the individual fibers, providing invisible stain protection. Instead of spending your time on your hands and knees, allow us to clean your tile & grout. We'll remove the dirt, grease and grim that accumulates in the porous grout lines leaving a sparkling floor that looks like new. The tile and grout is cleaned and then sealed to help resist future stains. Have a spot or stain that other carpet cleaners couldn't get out? Give us a call. We can get stains out other cleaners leave behind. "I especially appreciate the way the technicians handle the work that has to be done. I get quality work done by quality people that are clean and personable and dependable! Thank you..."
"Technician was very kind and courteous. I would recommend your service to others and use you again. I like the quick drying method. Thank you." "Heavens' Best is affordable and friendly and one of the best high quality carpet cleaning services in Manhattan." "Completely satisfied and very pleased with all he did. He did it very efficiently and thoroughly. My husband and I would definitely recommend your company to anyone we know who needs..."
"...carpet cleaning. Thanks for coming so quickly and doing such a great job!"